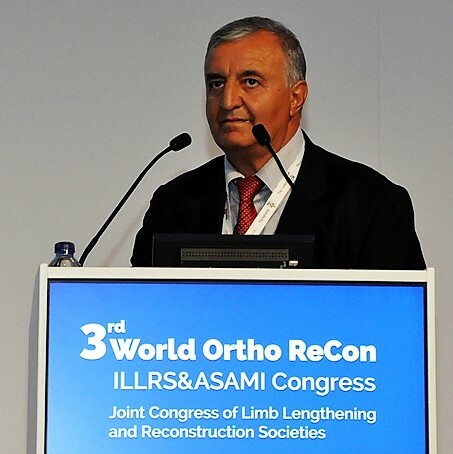 Prof. Ghassan Salameh ,MD. Ph.D.
A New Hinge External Distraction System in the treatment of limb lengthening and correction of axial devlations and Deformities (SALAMEHFIX) , (SLDF System). This is a New Hinged external fixation system which modified by Prof. Dr. Ghassan Salameh MD. Ph. 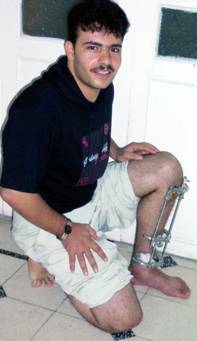 D.
Salamehfix – a hinged External Fixation System. It is an arc system rather than a circular system and consists of three small arcs. The arcs are not the same diameter so the system can take the shape of leg. 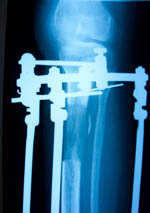 The entrance of screws and wires are in minimally painful regions so it’s more tolerable, provides for stable fixation and allows early full weight bearing. The small size of the system allows clothing to be worn over it with full mobility of nearby joints. This New hinges are already published and presented in many international Conferences and had a perfect discussion and impression; you can see details on the page of about us and activities. 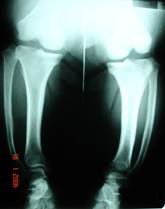 Lengthening 16 cm with correction of of sever bowing varus deformity and full weight bearing . Leg lengthening and foot deformity correction with very comfortible sitting on floor and full knee bending .